The Valley Planet, "What Then Must We Do?" 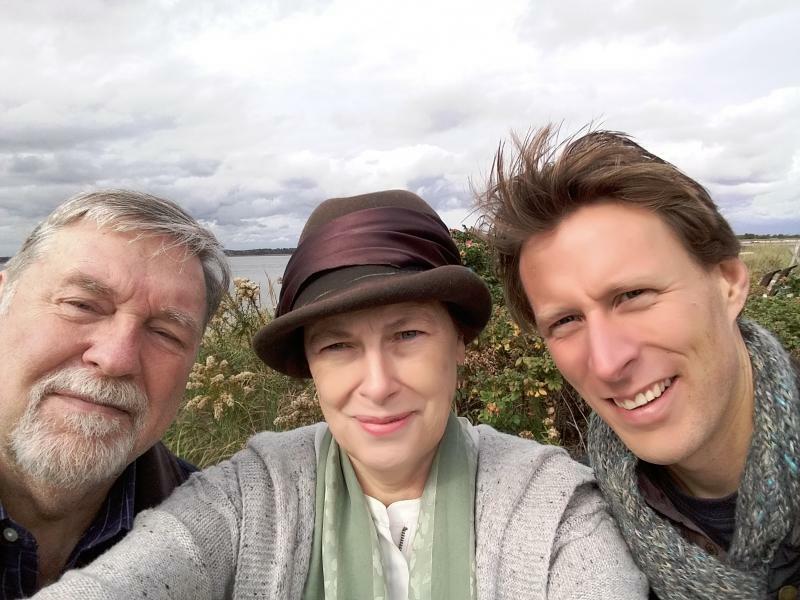 Peter Fulton, Bonnie Roberts, and Michael Bryant, Plum Island, October 2016, last day of a strange and wonderful adventure in poetry! I'm wearing that hat because of my unruly hair in the Plum Island winds! Other poets/writers in the volume who were unable to make the journey to America for the launch tour: Teifion Hughes, Rebecca Lowe, Sarah Evans, Mark Lyndon, Gwion Iqbal Malik,and Tony Webb. 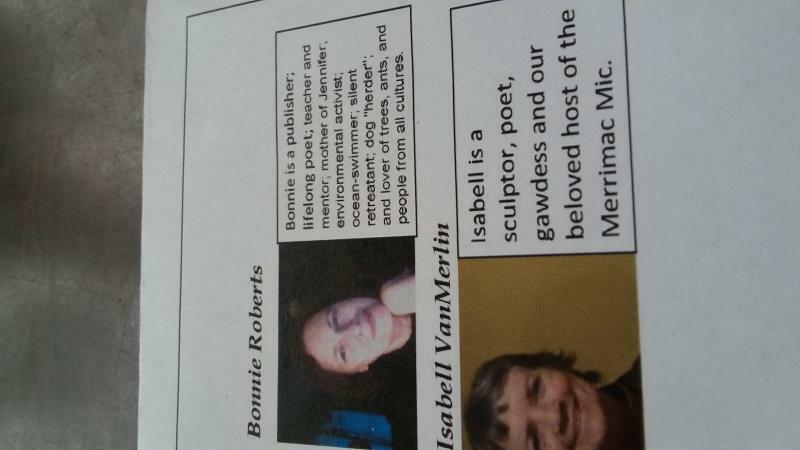 At the end of this page, I am offering poems, as well as some biographical information, by each poet who read on the tour. The tour was an international one, and all concurred that having an Alabama poet on tour was as good as including a poet from an entirely different country! And it was--or I was! 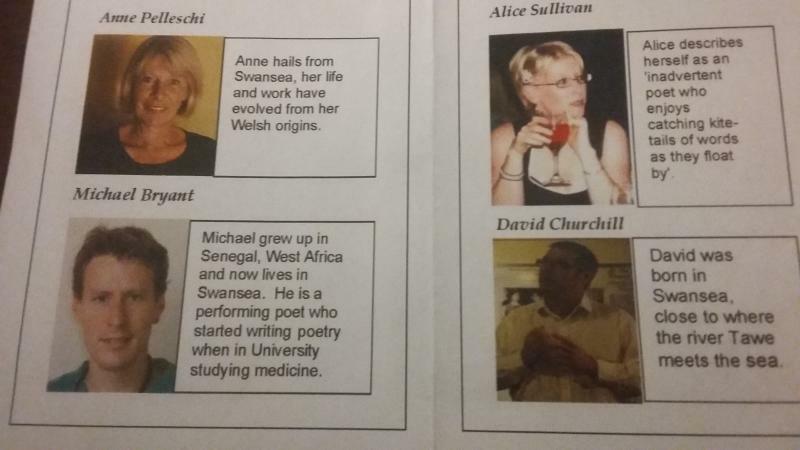 Peter Fulton created a clever "Official Passport to Wales," which includes photos of the four Welsh poets, a photo of me, and one of Isabell VanMerlin (hostess at one of our readings at Merrimac Mic). When one unfolds the passport, one finds photos of Swansea, Wales, including Dylan Thomas's childhood home, and the countryside he saw every day and around which he wandered. It is Anne Pelleschi who established Thomas's birthplace as a center to celebrate his early life. At each poetry venue, Anne gave a brief talk about those photos and shared fascinating facts about Dylan Thomas's life. Since I was (rather strangely) included in the tour, the title of the tour was ultimately, "Four Swansea Poets and Bonnie Roberts from Alabama." From the sound of that title, I felt like the dill pickle to the Welsh ice cream. Or, this was a most unusual touring group--and that's a good thing! The group really should have been called "Four Swansea Poets and Bonnie Roberts from Alabama and Peter Fulton from Massachusetts." Peter was our American host, who made arrangements for our lovely cottage near the end of Plum Island and who also set up the varied and significant venues. In addition, Peter was an important part of the tour when he read his fine poetry as part of this wild, crazy, and fulfilling event in the history of poetry in America. The Welsh poets arrived a day before me on October 21st, and spent a "cool" night, with howling winds and rain coming through parts of the roof. On October 22, I would discover that my room had two pots in the floor. Thank goodness, they were not needed very much my first night there. Just the occasional plunk of a single raindrop. The next night, however, the heat went out, and everyone froze. We were grateful for the duvets and new heaters the landlord brought; but, by the next night, the heat would not turn off and we thought (I thought) we would all smother to death or else open windows to arctic air to tone down the heat. We opened windows and simultaneously smothered and froze. Despite these minor incidents, I loved "The Arctic Cottage." It was a quaint New England beach cottage, with a comfortable, spacious living area, dividaed into two parts, one with a fireplace; five bedrooms, all upstairs; a kitchen and informal dining room; and--one loo (as I quicky learned to call the bathroom). The cottage had been advertised as having two bathrooms, but, alas, one of them was a wooden outdoor shower. When I told my daughter, she said, "Mom, if you have to choose between dirty and hypothermia, choose dirty, please!" Two of the Swansea poets brought family along. Dave Churchill brought his wife and son; and Alice Sullivan brought along her husband. That made eight people and one loo. Peter Fulton wisely remained at home with his wife Donna in Newbury Port, though he was our Boston guide. Most of our interactions as people and poets took place around the dining room table and in the kitchen. We did venture onto the front porch and the narrow beach, from time to time, but mostly, we stayed near the fireplace in the living area. Opening the front of door was relatively easy, since the wind was pushing from outside; but closing the door sometimes took three people! I loved every moment.The view from the cottage was spectacular, and I have posted some photos of the view below. Dave Churchill was the chef de résistance for all our breakfasts. For our last evening meal together, we all pitched in and some visitors brought entrées and goodies. During the day, while on the go, we ate most lunches out, and sometimes dinners as well. What I love so much about these Welsh poets is both their "adventurous spirits" and their uproarious laughter. We did a lot of laughing around the table, and often until late into the night. This did not bode well for those upstairs trying to sleep because, even though all rooms had doors, the walls did not go all the way to the ceiling. I heard some amazing things during the night--I'm not exactly sure what, but there was a wide variety. I loved hearing laughter in the kitchen and the occasional debate. One major debate centered around this question: Does poetry sell? Most of us eventually agreed that it does not sell very well at all. Good selling in many ways depends upon an "outsider" to sell or promote books for you. 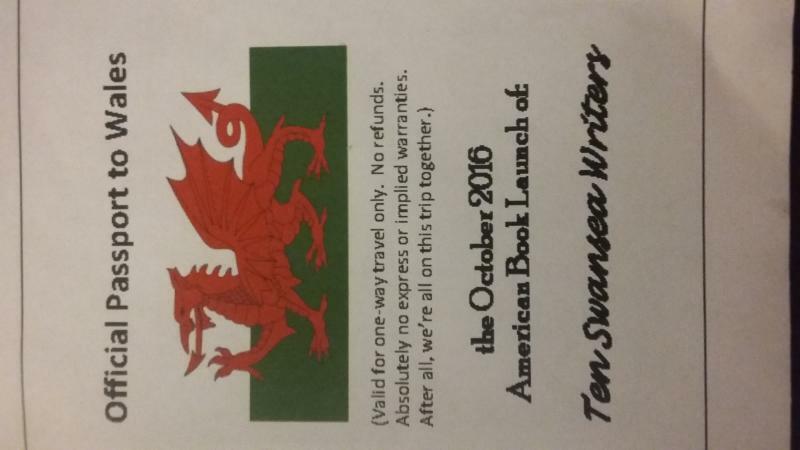 I am here in America promoting these poets and this finely written anthology by gifted writers--Ten Swansea Writers, Talisman Arts Group. I want this book to do well, to travel far and wide. If all goes well, I hope to travel to Swansea someday to read my work in the land of Dylan Thomas. At some point, I hope to host a few Welsh poets here in Alabama. The Welsh are brave hearts-- and, for visiting Alabama, fortified inner strength is a must! Some of these reading venues we were forced to miss because of a)Boston traffic delays, b)one of our three cars getting away from the caravan, and arriving somewhere close to New Hampshire, c)or one of us (I, that is) had to miss because of the glorious but exhausting schedule and the intense Boston walkabout. Some of the venues were just outside Boston in Newbury Port, Massachusetts, where we read at the Actor's Studio as the climax of the tour. Friday, October 21: Arrival of Swansea poets at Logan Airport. Settle in at the Arctic Cottage on Plum Island. Saturday, October 22: Arrival of Bonnie Roberts at Logan. Settle in at Arctic Cottage and listen to English-speaking people whom she could not, at first, understand. The Welsh poets had the same problem in understanding "Alabamian" speech. 2nd Event: "Meet, Greet, Read," 10:30 a.m.-1:00 p.m. Afternoon: Robert Frost farm, short tour of home. Wednesday, October 26 Free time. (Anne Pelleschi, Michael Bryant, and I took part of the day to go on a whale watch in Boston Harbor; others chose different activities. Anne and Michael were very gracious not to hold a grude that we spent precious hours--and no whales were sited! Personally, I loved just being on the wild, wild ocean that day! Thursday, October 27 Free time in morning and early afternoon. Anne Pelleschi, a photographer friend of Anne's, Michael Bryant and I visited the charming small town of Rockport, MA, where we had breakfast overlooking the water. Michael and I both had two cups of hot chocolate, maybe not a good idea, but it seemed like the delicious thing to do at the time. Michael and I got lost from Anne and friend and went shopping. Michael always wears "unusual" pants when he reads, and he found yet another perfect pair for the final reading. I found a white, fuzzy llama--a tiny replica--to bring home as a souvenir. Even though there are NO llamas in Boston--not that I know of! Like the Actor's Studio in New York, we read from a basically bare stage. The Studio is small and reminded me of a "black box" theatre. Anne went over the "Passport," to talk about the photos of Dylan Thomas and discussed the origins of the anthology Ten Swansea Writers, Talisman Press. Michael Bryant, Alice Sullivan, Peter Fulton, and I read from the stage, talked briefly about our poetry, and read four poems each. This event was the closing, sold-out audience, climax of the tour. The four Swansea poets and family left the Actor's Studio to catch their flight home. It was a bittersweet parting. In the short time I was with these delightful people and poets, I came to like, respect, and love them. With some, I have made lifelong friendships. Because I could not catch a flight out the next day, I had two more nights to spend in Massachusetts. The group put me up in a cozy, quaint bed-and-breakfast, the Essex Inn, in walking distance of everything in Newbury Port, including the bookstore "Jabberwocky," which had more books in one place than I have experienced in a lifetime. Not a bad thing! Peter and Donna Fulton treated me to a fine dinner my last night,at the Black Cow, overlooking the water, as most all restaurants in this area of New England do. Michael Bryant works for Doctors Without Borders, when he is not writing poetry. His experience in hospitals in places of poverty, both physical and intellectual, inform his work. Their voices echoed thunder's threat. And raised her on a stake for a community's healing. Your daughters hauled twice their weight in sticks. And left you free of their trust. And scorched by sons of convention. Yet birthed in a frightened, constricted pupil. And released through misogny's contracting canal. Straw ceilings and iron-roofed engines. To strange excuses of culture. To shield your daughters from violation. I must not be here now. The shared and binding thread. I cannot face Us or Ours, even in describing the past. The mad engulfing, light-filtering family-tree. To hide in the debris a semblance of a single me. I will move now to a new house and live with an old faith. Of love and happiness nurtured through ignorance. Or floating strata-forms of Nirvana clouds. Of throat untutored and unplaced in scale. The speckle of green and hazel. The singing and rainbow of eyes? So ask me again, my son, when the world has turned again. Despite the years to catch the meaningful phrases. Anne Pelleschi, a poetess of primarily haiku, draws her poetry from "historical and emotional consciousness." Anne established Dylan Thomas' birthplace as a "successful centre celebrating his early life." Since Anne's work is brief, I am offering four samples of her imagistic and engaging work. where breakers lap and swallow. of stones disgorged by birds. Alice Sullivan stands "knee-deep in a chaotic stream of consciousness and children, temporarily looking up and out to escape earthbound mundanity through her writing." Her beloved children figure often in her work. must take his own first breath. the traveller survived despite himself. and the child was born. Guilty distress, impotence, fury, love. but I mind, I cry, I care. My precious child, I'm sorry. and now you hurt at my touch. But would I do the same again? or free you with love? Peter Fulton, Massachusetts poet and publisher, author of flying stones, a multi-media, digital poetry book, was our host for the Ten Swansea Writers and Bonnie Roberts, Poetry Tour, 2016. When not writing or publishing (MediaFusion), Peter is an attorney. Bonnie Roberts . . . well, if you know this website at all, you don't need any biographical information about me! I also have a fairly thorough profile at www.Linkedin.com (Bonnie Gibbs Roberts). From October 22-October 27, I was honored to be on tour with four of the Swansea, Wales poets. I was invited by Peter Fulton, the Massachusetts poet and publisher who arranged the tour, from this side of the Atlantic. In Wales, Anne Pelleschi organized her group of poets to come to America, and also invited me, based on Peter Fulton's recommendation. 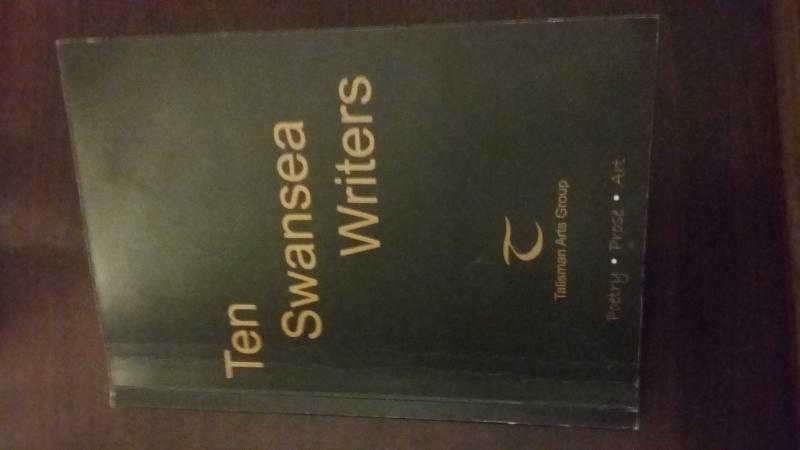 Their purpose: To launch their new book, Ten Swansea Writers--an anthology of poetry, prose, and art--from Talisman Arts Group. Only four were able to make the journey, but those four are among some of the best poets I have ever read. They were Anne Pelleschi, Michael Bryant, Dave Churchill, and Alice Sullivan. ﻿ To quote from the back of Ten Swansea Writers: Poetry, Prose, Art: "On reading the varied styles and topics within this book, the reader will discover how Swansea's human and physical landscapes have influenced the writers, just as it did for Thomas." For more information about the Talisman Arts Group or to purchase a copy of Ten Swansea Writers, go to www.talismanartsgroup.com or to talismanartsgroup@gmail.com. Origin of the anthology: The Talisman Poetry Group meets at Tino's Coffee Bar in Wind Street, Swansea on the first and last Wednesday evenings of each month, from 8-10 p.m.
You are always guaranteed a warm welcome as either a reader or as a listener. As a poet who has attended more workshops than I can remember, I highly recommend this energetic group. They read and discuss not only poetry, but prose. I believe their unity of purpose has, in part, given Ten Swansea Writers its strong poetic visions, which include "wide range approaches, interests, ideas and styles." PLUM ISLAND is actually an island, though it appears to be a peninsula. After one drives past Bob Lobster restaurant on the left and a pink house in the middle of a marsh on the right. (a story in its own right! ), one crosses a short bridge over a small river, about 40 feet wide. The Merrimac River passes to the left side by Newbury Port, MA and the porch of the Arctic Cottage, then spills its way out to the Atlantic. Looking from the porch of the cottage, the Merrimac looks like a large bay with Newbury Port in the distance, to the southwest and Salisbury, MA to the northwest. Annie Pelleschi, with whom I have since become dear friends/sister poets across the Atlantic, says I spoke with a "very odd accent." To me, of course, it was the other way around, but I love the Welsh accent that sounds like music. The Swansea Poets and Bonnie Roberts Poetry Tour in an around Boston was one of the most delightful literary adventures of my life--just when I thought those very important, life-infusing adventures had perhaps ended. For me, one of the highlights of this journey was the kitchen table on Plum Island. When all of us sat around it, laughing, "gently" quarreling, making jokes, sharing our personal and poetic lives--this was the BEST. I came to love these poets and to appreciate and respect their poetry very much. It also felt good to be accepted as an honorary "Swansea Poet on Tour." Thank you, Peter Fulton, for getting me together with this group. Thank you Anne Pelleschi for your "wild woman, force-of-nature Welsh lady" who loved to "bollock" me about my over-concern with my hair. At one point, I walked down the steep steps from my room, with a hairbrush stuck in my hair. Since then, Annie and I have a long-standing joke about "the Hairbrush Poet from Alabama." MIRACULOUSLY, THIS TOUR HAS NOT REALLY ENDED! Anne published my fourth collection of poetry, Dusting for Prints, in March of 2019, not quite 3 years after the Swansea US Tour. She has invited me to launch the book in Swansea, and I have accepted her offer, without her having to twist my arm! I leave Huntsville on March 31, land in Heathrow on April 1, and then make the rest of the trip by bus or train to Swansea. I love my new book! It is my first collection since 2002, when Pudding House published Bonnie Roberts: Greatest Hits and Elk River Review Press published Dances in Straw with a Two-Headed Calf. Because of the time lapse, I used 4 poems from earlier collections. The Preface of Dusting is actually a poem from my first collection, To Hide in the Light: "A Prayer: Far Beyond Poetry." More pre-primordial paintings coming in October--if you think you can bear it! More poetry! Video-taped poetry readings! Please send me your news!